Solid hardwood cabinets of beautiful design and construction. A door keeps inquisitive fingers away, as well as dust! mounted to your wall. (balls and acrylic cubes are not included). Includes up to 20 free nameplates. Space between Shelves: 3.25" , Acrylic cubes are required to be the standard 3.25" cube size. If you have larger, then most likely they will not fit. Includes up to 40 free nameplates. choice of a cherry or black finish. Features a round acrylic puck holder. Engraving area approx 4 x 1-1/4. Includes 1 free nameplate. 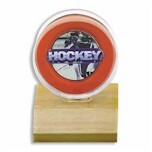 Single hockey puck wall mount acrylic display case with walnut wood plaque. The plaque comes ready to hang with all mounting hardware included. gold tone mount. The plaque is 7" x 9"
you plenty of room for a lot of text. 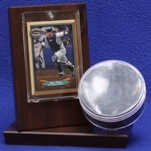 Single puck & card acrylic display case made of wood with cherry finish. The trading card holder is acid free and has a magnetic closure for easy access. 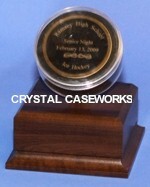 Single acrylic hockey puck display case with genuine wood base. Comes in your choice of light wood or dark wood. The 2 piece design makes inserting/accessing the puck quick and easy. Price includes 1 free nameplate. Additional nameplates are available. and features an acrylic door (98% UV resistant with two keys) with brass lockable latches to keep out dust. heavy duty wall hanging hardware (hockey stick and items shown in case are not included). Includes 1 free engraved name plate. No limit on the amount of text you can have. 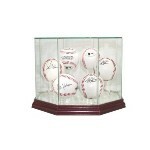 way to display your autographed or memorable hockey pucks. Felt-lined background to create a stunning display. This unique cabinet holds 20 pucks. Cabinet comes ready to be mounted to your wall. (pucks are not included). stunning display. This unique cabinet holds 40 balls. Shelves have indentations to secure balls. Brass hinges and door latches. Cabinet comes ready to be mounted to your wall. (balls are not included). see the entire puck. Includes 1 free nampelate. real UV protected glass. Includes 1 free nampelate. mirrored so you can see the entire puck. nameplate/plaque please see Item Code:HOCKEY-201. Interior Dimensions 4" x 4" x 4"
Dimensions 4 x 5 x 4. Our unique hinged design allows for easy access. Mounting hardware is included. 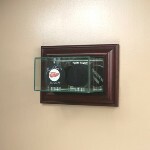 Wall mount single hockey puck glass display case featuring a mirrored back and furniture grade wood frame and real UV protected glass. Interior Dimensions 4 x 5 x 4. Our unique hinged design allows for easy access. Mounting hardware is included. optically clear real UV protected glass and mirrored back panel. The base is mirrored so you can see the entire puck. Includes 2 free nameplates. The base is mirrored so you can see the entire puck. Inside dimensions are 7x4x4. access. Mounting hardware is included. 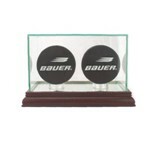 Wall mount double hockey puck glass display case featuring a mirrored back, furniture grade wood frame and real UV protected glass. Inside dimensions are 7x4x4. Our unique hinged design allows for easy access. Mounting hardware is included. so you can see the entire puck. Includes 3 free nameplates. Additional nameplates are available. Interior Dimensions 10" x 4" x 4"
and optically clear real UV protected glass. Features a mirrored back panel. The base is also mirrored so you can see the entire puck. Interior Dimensions 10" x 4" x 4"
easy access. Mounting hardware is included. Wall mount triple hockey puck glass display case featuring a mirrored back, furniture grade wood frame and real UV protected glass. Interior Dimensions 10 x 5 x 4. Our unique hinged design allows for easy access. Mounting hardware is included. furniture grade wood base and real UV protected glass. The base is also mirrored so you can see the entire puck. Includes up to 4 free nampelates. Additional nameplates are available. Full size hockey goalie mask - helmet glass case with moveable custom stand. furniture grade solid wood base and real UV protected glass. The base is mirrored so you can see the entire helmet. Interior dimensions are 14-1/2"L x 11"W x 13"H.
etched or a traditional engraved nameplate - plaque, please call or email us. 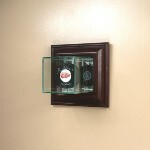 Glass octagon display case designed to hold up to 5 hockey pucks. This case features 5 riser tube puck holders. real UV protected glass. The base is also mirrored so you can see the entire ball. Includes up to 5 free nameplates. Additional nameplates are available. If you don't want nameplates, leave the fields blank. and furniture grade wood base and real UV protected glass. Includes up to 6 free nampelates. Additional nameplates are available. 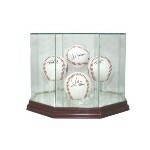 Glass display case designed to hold up to 7 baseballs. 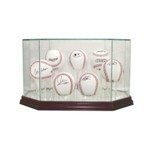 This case features 7 riser tube - ball holders. Includes up to 8 free nameplates. Additional nameplates are available. Inside dimensions are 13.25 x 9.25 x 7;. 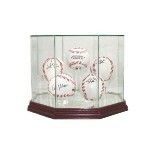 Glass display case designed to hold up to 8 baseballs. 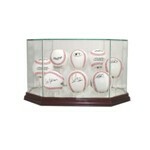 This case features 8 riser tube - ball holders. Includes 12 free nampelates. Additional nameplates are available. Interior Dimensions 36" x 4" x 4"